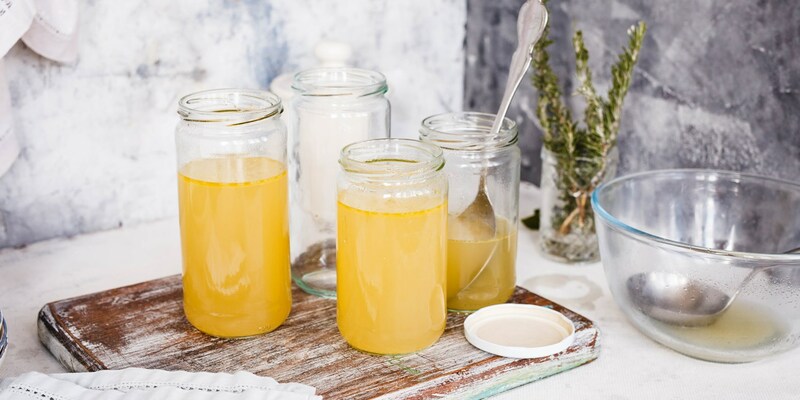 Homemade chicken stock has to be one of the oldest, most basic and most frugal recipes in history. Yet it is an utter luxury — and rarity for most — to have a batch of homemade chicken stock in the fridge or freezer at home. Stock cubes are a quick and easy alternative, but they don't have the richness and complexity of flavour of a good, homemade stock. To make a darker, stronger-flavoured stock, start by browning the bones before simmering them in water- also known as brown chicken stock. Use such darker varieties of stock for stews and casseroles. Chicken stock can be flavoured to suit the dish it is being added to. For example half-way through the simmer, add a handful of dried Chinese mushroom or fungus to introduce savoury, umami flavours to the chicken broth. Or for an Asian-inspired chicken stock, experiment with infusions such as ginger, chilli and garlic.